Every month we are presenting a new map quilt to inspire you to take up our challenge and encourage you to sign up for a workshop with Valerie Goodwin to learn her techniques and try your hand at a map quilt under her guidance. This sampler quilt merges the two artistic realms that I obsess about the most in my creative world- quilt making and Western Traditional tattoos. Both of these folk art forms have rich traditions and histories that I find utterly fascinating. I have been making quilts for 30 years, but I’m relatively new to the world of tattoos, having been collecting for just four years. It did not take long for me to find my stylistic focus when it came to tattoos I wanted to wear for the rest of my life. There are reasons why the classics (whether in quilts or tattoos or any other longstanding art form) always hold our gaze- they have a timeless quality and provide a strong connection to our past. They are unaffected by trend and fad. “Mr. Waters” is Percy Waters, a well-known and very prolific tattooer, tattoo designer, and tattoo supplier who set up his practice and supply business in Detroit and worked there throughout the 1920s and 30s. I am a Michigan native and grew up in a blue collar town about 20 minutes south of the Motor City. My own grandfather was extensively tattooed and dabbled in amateur tattooing during The Depression in the Detroit area. It is possible that the two men crossed paths at one point or another during that time, but I’ll never know for certain. Like traditional quilts, Western Traditional tattoos have a number of designs and motifs that recur and are revisited over and over again through the continuing work of tattoo practitioners and their clients. “Me & Mr. Waters” reinterprets some of these tattoo classics and transforms them into quilt blocks. 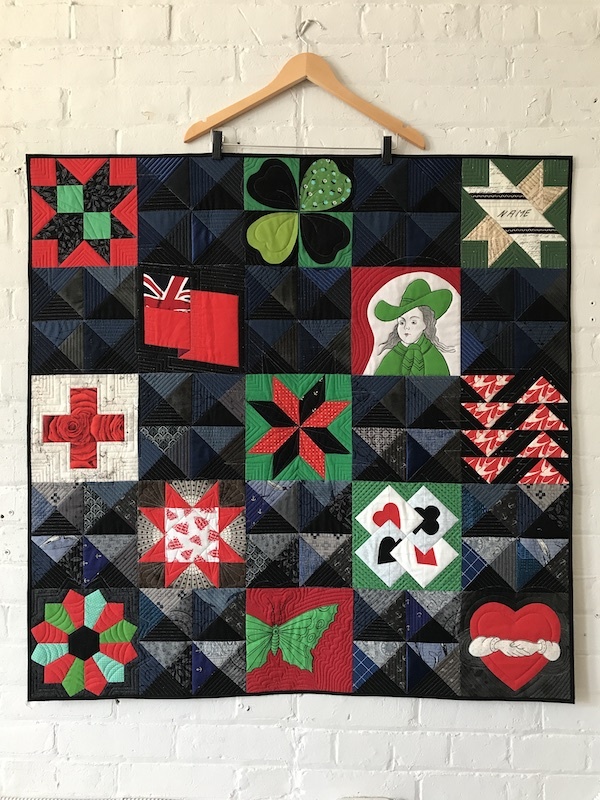 If you look closely, you will find patchwork interpretations of Nautical Stars, The Rose of No Man’s Land, two blocks representing Luck, the patriotic Canadian Red Ensign, the Spiderweb, and Homeward Bound. Swallows are enduring designs, as well as simple banners bearing the name of a loved one. The appliqué blocks are direct copies of Mr. Waters drawings, taken from reference materials in the collection of the Henry Ford Museum in Dearborn, Michigan. I wear the beautiful Waters butterfly on my wrist. The very limited colour palette used here is in keeping with the colours in common use with very early Traditional tattoos. These colours had the best staying power in the skin (and still do). My favourite shop uses these colours almost exclusively, maintaining their historic connection to the tattooers whose work they continue to celebrate and carry forward. The alternate blocks composed of Hourglass units are constructed and arranged in a gradient of sorts. Starting very dark and mostly solid blue and black at the top, they transition to lighter, printed fabric moving toward the bottom of the quilt. I cannot resist a gradient. Viewed on their own, they have a 3D effect, which was a really fun illusion to create. “Me & Mr. Waters” was super-ultra-custom-long-arm quilted by the exceptionally talented Agnes “Bob” Gentili (aka Geeky Bobbin), who worked with me to bring this quilt to life. This quilt will be on display at Quilts at the Creek this summer, so be sure to attend, and check it out! Jacquie Gering has taken on our “Map Your World” challenge! Jacquie is an internationally known quilt designer, teacher, and author, as well as former chairman of the board of directors of The Modern Quilt Guild. She led workshops at Quilts at the Creek several years ago, and we are thrilled that she is participating in this challenge. 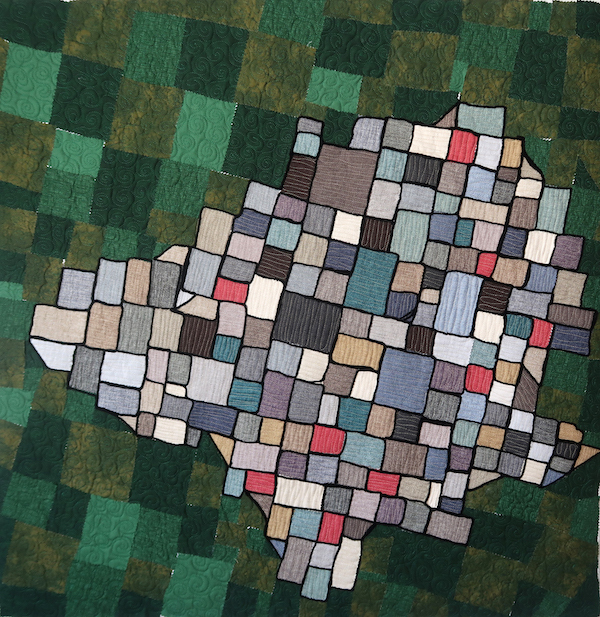 The quilt, titled “Quiet Geometry”, maps the influences that helped shape her quilting voice. 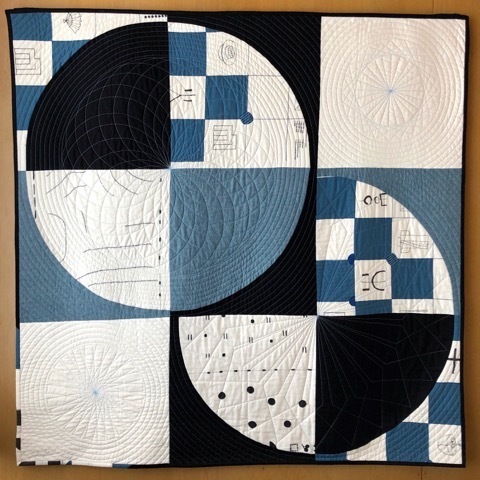 The quilt is simple but graphic. It consists of simple shapes, minimalist design, walking foot quilting, and solid fabrics, as well as a print by Yoshiko Jinzenji. Yoshiko is a quilter who has had a big impact on Jacquie’s design style and process.